You can learn about the Clog Hog drain cleaner by watching this 3 minute video, or by clicking any of the frequently asked questions below. To find out if a sewer jetter is the right drain cleaner for the job, visit our Drain Cleaning Tips page. You can also view and save our free Sewer Jetter Guide. Is it safe for my pipes? Is a pressure washer always required? Does the 100 foot model perform as well as the 50 foot model? Do you sell drain cleaners over 100 ft. long? Can I join two sewer jetters together to make a longer jetter? Will it work with my model of pressure washer? My electric pressure washer is nearly 2 GPM. Is it as powerful as a gas machine? My machine is 3.0 GPM. Why can't I use a jetter rated for 2.9 GPM? How much does US or international shipping cost? Do you have local retailers in the USA, Canada or other countries? Can I get parts to repair my sewer jetter? How does a sewer jetter work? How does it attach to my pressure washer? What sizes of pipe can I clean? What kind of drain opening can I use? Can I use a sewer jetter in ceramic drain pipes? Can I run a Clog Hog drain cleaner through a toilet? Can it clear landscaping drains, septic lines, and drain tiles? Can it remove tree roots? Can it thaw frozen drain lines? Can it remove iron ochre clogs caused by iron eating bacteria? Can I use the Clog Hog drain cleaner indoors? Can it clean swimming pool drain lines? Can it clean black corrugated outdoor field drains? How long does it last? Should I buy an extra nozzle? Can you recommend a pressure washer to buy? Is it ready to use? What else do I need to buy? What length of Clog Hog drain cleaner do I need? Can I buy a spare nozzle? Can I get a rotating nozzle? Can I get an extra hand valve to control the sewer jetter? Can I order by phone, mail, fax or email? How is it different from a mechanical drain snake? How is it different from other sewer jetters? How can I help make sure the job will go smoothly? What can I do if one of the nozzle jets doesn't spray? What can I do if no water flows out of the jetter at all? My pressure washer cycles off and on. Is this normal? I'm having problems reaching the clog. What can I do? How can I get my sewer jetter delivered faster? Where do you ship Clog Hog products? If you've got a question not answered here, please contact us. The Clog Hog drain cleaner is a sewer jetter that uses the force of pressurized water to pull itself through pipes, scrub the sides of dirty drains, break apart clogs and flush out residue. A jet nozzle provides the pulling and cleaning force. A high-pressure line that's flexible enough to pass through most main drain elbows, yet handles up to 4,000 PSI. A jet nozzle with one forward-firing jet that breaks apart clogs, and three back-firing jets that pull the high-pressure line deep into clogged drains. An adapter that's designed to fit your type of pressure washer. The Clog Hog drain cleaner is made from quality, industrial-grade components and is custom-matched for different types of gas and electric pressure washers. The Clog Hog drain cleaner attaches to different types of pressure washers in slightly different ways. If you've got a gas pressure washer, the Clog Hog drain cleaner attaches to the body of your trigger gun after you remove the original metal spray wand by turning the twist ring collar on the spray gun body clockwise. If you've got an electric pressure washer, you may need to choose an additional adapter to fit your trigger gun. Yes, a pressure washer is always required to power your Clog Hog drain cleaner. You'd get no usable cleaning and pulling force by connecting the drain cleaner directly to your household water supply, even if the water pressure is unusually strong, or to anything other than your pressure washer. Clog Hog drain cleaners for residential gas and electric pressure washers are generally effective cleaning drains up to 4" ID. Clog Hog drain cleaners for commercial gas pressure washers are generally effective cleaning drains up to 6" ID when powered by machines rated 3.0 to 4.0 GPM. Lateral drain lines below 3" ID often have short-radius elbows that can block most sewer jetter nozzles. Your best choice to clean a lateral line is usually to start by trying a 25 Ft. handheld drum auger that many hardware stores sell for less than $30. If you're able to pass a drum auger through the lateral drain line, and you need to scrub the sides of the drain and flush out residue, a Needle Nose™ drain cleaner is a sewer jetter than can pass through almost as many smaller diameter elbows as a handheld drum auger. To unclog your drain with a sewer jetter, you'll need to find the right drain opening so you can access the problem area without passing through tight elbows, traps, or other transitions that could block the jetter nozzle. If you have several clogged plumbing fixtures in different rooms, it often means that the problem is in the main drain. In this case it's often easiest to insert the jetter into a main drain cleanout in front of your home or in a basement, pointing the jetter uphill in the direction of the clog. In some cases there can be sharp elbows or other transitions in the main drain that make it difficult for the sewer jetter to pass all the way through. In this case you might need to find a secondary, clogged drain opening or cleanout that's uphill of the problem area (such as an opening under a sink or a shower floor drain), and point the jetter nozzle downhill. You might also be able to access the main drain from a roof vent, but you will need to take extra safety precautions when working on a roof. 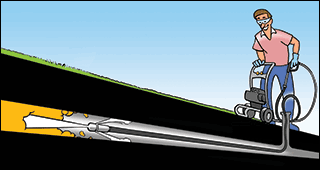 For more about cleaning a main drain, visit our Drain Cleaning Tips page. If only the plumbing fixtures in a single room or small portion of a building are clogged, the problem could be in a lateral drain line. It's usually not possible to reach the clog in a lateral drain line when starting below from the main drain cleanout. 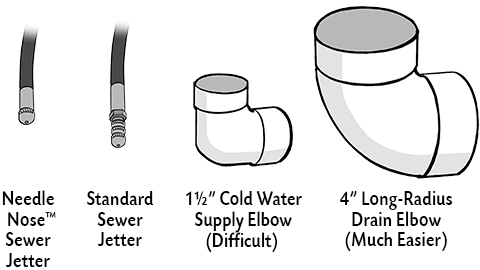 Lateral drain lines are generally smaller in diameter, and are more likely to have tight elbows that block most sewer jetters. For this reason your best choice is usually to start by trying a 25 Ft. handheld drum auger, as detailed on our Drain Cleaning Tips page. If you're able to pass a drum auger through the lateral line, and you need to scrub the sides of the dirty line to flush out residue, the Needle Nose™ drain cleaner can pass through almost as many smaller diameter elbows as a handheld drum auger. A drain opening under a sink that you expose by removing the trap. A shower or floor drain with the drain cover removed. 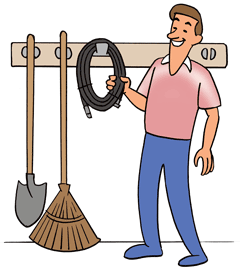 A cleanout opening on a wall inside the home, on an exterior wall, or behind the home. A drain opening in the floor that you expose by removing a toilet. Note: it's generally not possible to pass a sewer jetter nozzle directly through a toilet or sink trap. And, if you've had difficulty passing a handheld auger through a drain opening, a sewer jetter probably can't pass through either. If cleaning an outdoor sewer drain, septic field line, landscaping drain or French drain you will need to insert the sewer jetter into a drain opening that leads directly to the problem area, without passing through a drain fixture that could block the nozzle. It's usually necessary to start from a downhill opening and point the sewer jetter in an uphill direction toward the clog. This allows gravity to work with the back-firing nozzle jets for better cleaning and flushing, and gives heavier outdoor sediment an easier path to exit the drain. It's generally not possible for a sewer jetter to pass through a distribution box, catch basin, or other type of outdoor drain fixture unless you can feed the nozzle through the exposed fixture by hand. And, if you find an unexpected amount of mud or sand in an outdoor drain with no obvious source, you should carefully inspect the drain before inserting a sewer jetter or mechanical drain snake, since drain cleaners can sometimes get stuck in separated and collapsed sections of pipe. For more on this topic, visit our Drain Cleaning Tips page. The Clog Hog drain cleaner is designed for PVC (plastic) and metal drain pipes. You should avoid using a sewer jetter in ceramic (clay) and Orangeburg (wood composite) drain pipes found in some older homes, since these types of drains are more likely to clog because of cracks, breaches and structural collapse. Once this occurs, a drain cleaner could work itself into a preexisting crack or collapsed area of the pipe, and a difficult extraction job could result. If you're concerned that a plastic or metal drain might not be in good enough condition to clean with a sewer jetter, before buying the drain cleaner you can test an exposed piece of the pipe by spraying it with your pressure washer spray wand on its most forceful nozzle setting, at zero distance. If the pressure washer scores or erodes the pipe material, then you can expect a sewer jetter that's powered by the same machine to also damage the pipe. You should avoid using a sewer jetter and contact a licensed plumber for help if you suspect that a drain has structural damage or is weakened by tree roots, foundation damage, or other causes. You should avoid using a sewer jetter to clean ceramic (clay) pipes. Ceramic pipes more often clog because of large cracks, tree roots that enter and expand any gaps in the pipe wall, or structural collapse. Should a sewer jetter or mechanical drain snake enter a large, preexisting crack or breach in a ceramic pipe you could have a difficult extraction job. Instead of running a sewer jetter through a toilet, it's recommended that you remove the toilet, run the jetter directly into the drain opening in the floor, and then reinstall the toilet. That's because a sewer jetter's steel nozzle can scratch the visible ceramic surfaces, and can get stuck inside the tight bends of many toilet traps. 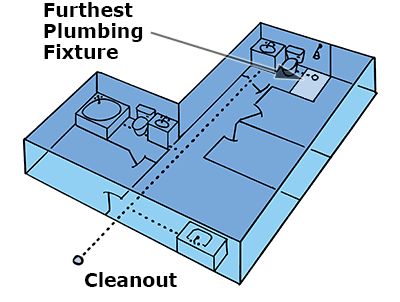 You can visit our Drain Cleaning Tips page for more tips to unclog a toilet. Sewer drains that run from your building to a city sewer or septic tank. Septic system or leach field lines. Landscaping, agricultural, and gutter drain lines. Drain tile (or "French drain") lines that surround your building. You can visit our Drain Cleaning Tips page for tips to unclog different kinds of outdoor drains. The Clog Hog drain cleaner can't cut through tree roots. It can clear sediment around tree roots that contributes to drain blockage, but growing roots will eventually need to be cleared with a different machine that's designed for that job. To remove tree roots plumbing service companies typically use very large truck or trailer-mounted jetters with special cutting nozzles, or mechanical drain snakes with cutting blades. Note that while it's rare for sewer jetters to get stuck in drains, this could potentially happen inside of a drain that has been cracked or separated by tree roots. You can visit our Drain Cleaning Tips page for more information about removing tree roots. Clog Hog sewer jetters are frequently used for thawing frozen pipes and removing frozen blockages from sewer drains. When sewer jetting inside a frozen drain, keep the sewer jetter moving and water flowing through the jetter. Most customers are able to clear frozen drain lines using cold water to supply their pressure washers. Note that Clog Hog drain cleaners are rated for water up to 120 degrees F; this is equivalent to the hot water supply temperature in many homes. However, before using heated water check your pressure washer temperature rating. You can visit our Drain Cleaning Tips page for more information about removing frozen icy clogs. You can use a Clog Hog drain cleaner to remove iron ochre clogs caused by iron bacteria, provided that the pipe is in good structural condition and does not have any short-radius elbows or transitions that could block the sewer jetter nozzle. After you remove the clog, it's usually necessary to treat the source of the iron bacteria to prevent the clog from returning after a few months. Our Customers Page has before and after photos of an iron ochre clog that was removed with a Clog Hog drain cleaner. You can visit our Drain Cleaning Tips page for more information about removing iron ochre clogs. You can clear clogged pipes from inside your home by following these steps. Always use the Clog Hog drain cleaner in a well-ventilated area. Always operate a gas-powered pressure washer outside. 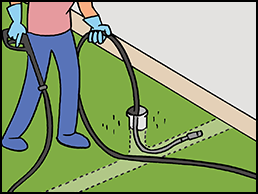 If the hose from your gas-powered pressure washer to the trigger gun isn't long enough to reach the indoor drain entry point such as a cleanout or a drain opening under a sink, use a pressure washer extension hose. To avoid water damage to floors, check all hose and trigger gun connections for leaks outdoors with the pressure washer running before you bring the water lines inside. For easier handling and cleanup, partially unroll and insert the high-pressure line in smaller increments as needed. 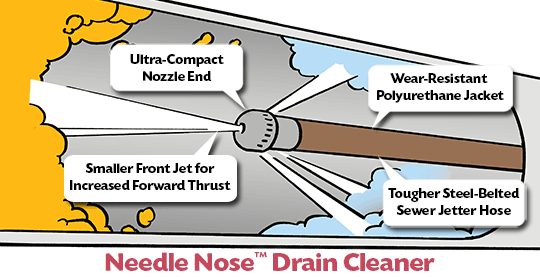 Note: Clog Hog offers the Needle Nose™ drain cleaner that's designed to pass through more types of elbows and transitions in lateral drains as small as 1½" ID. When cleaning from the drain from an opening under a sink, you should have an alternate drain opening available since it can sometimes be difficult for a sewer jetter to pass through the tight elbows found in smaller, lateral drain lines. You can visit our Drain Cleaning Tips page for more tips to unclog indoor drains. Swimming pool drains are usually made from small diameter PVC cold water supply pipes with sharp 90-degree elbows that can block a sewer jetter. For this reason, your best choice is usually to start by trying a 25 Ft. handheld drum auger that many hardware stores sell for less than $30. If you're able to pass a drum auger through the swimming pool drain, and you need to scrub the sides of the drain and flush out debris, Clog Hog offers the Needle Nose™ drain cleaner that can pass through almost as many short radius elbows as a handheld drum auger. You can visit our Drain Cleaning Tips page for more tips to unclog swimming pool drains. Cleaning corrugated (accordion style) outdoor field drains is a common use for Clog Hog drain cleaners. Note that if your drain pipe is clogged with dirt or yard debris it might take a gas pressure washer for good cleaning efficiency since dirt and yard debris can be heavier than indoor waste materials, and can require more force to flush away. When cleaning an outdoor field line it's almost always easiest to start at a downhill location and let the nozzle pull itself uphill toward the clog. This can give a clearer path for the sediment to wash out of the drain, and allows you to watch the amount of sediment washing back to determine when the line is clean. You can visit our Drain Cleaning Tips page for more tips to unclog landscaping drains. The Clog Hog drain cleaner is designed to be used many times, but its components will eventually wear. The life of your jet nozzle depends on the operating pressure of your jetter, the amount of sediments in your water, and the type of pipe that you clean — with PVC (plastic) pipes producing less wear than metal. Your jet nozzle will normally wear gradually over time, with a slow enlargement of nozzle orifices and a gradual drop in cleaning pressure the result. If your water supply is reasonably free of sediment, your pressure washer operates at 4,000 PSI or less, and you are cleaning primarily PVC drain pipes, you can usually expect to use the drain cleaner dozens of times before replacing the nozzle. Most nozzle issues occur when small debris enters the sewer jetter from an open supply hose. For this reason it's important to always flush your garden hose, pressure washer, high-pressure hose and trigger gun with clean water for at least 30 seconds before you attach the sewer jetter. We offer replacement nozzles on the Accessories tab of each product page, and when you check out. Keeping it in a cool place away from sunlight when not in use. You should inspect all components of your Clog Hog drain cleaner after each use – including the nozzle, hose, and end fittings – and replace any item that appears damaged or worn. Clog Hog doesn't collect reliability information about different pressure washer brands, so it's difficult for us to recommend one manufacturer over another. Nearly all gas-powered pressure washers sold at major retailers can power the properly selected Clog Hog drain cleaner its full length into most 4" ID drains. If you plan to buy an electric pressure washer, we recommend a machine that's rated 1.2–1.6 GPM to power the drain cleaner at least 50 feet into most 4" ID drains. Customers report that private label electric pressure washers advertised as delivering 1.7–2.0 GPM (often 1.76 GPM), with brand names such as Sun Joe, Ivation, WEN, Xtremepower US, PowRyte, Goplus, Flagup, Binxin, Powerhouse, Costway, Arksen and others, produce much less than their advertised flows under load— typically closer to 1 GPM. This makes these private label electric machines suitable only for simple drain cleaning jobs where the clog is less than 30 feet from the drain opening, there are few elbows or transitions in the line, and there is only lightweight indoor waste that can be easily broken up and flushed. You can contact us with your pressure washer manufacturer and model number and we will be glad to recommend the compatible drain cleaner. The Clog Hog drain cleaner comes fully assembled and ready to use, including the high pressure line, jetter nozzle, and adapter to fit most types of pressure washers. If you own an electric pressure washer you can buy a Drain Cleaner Set that includes a drain cleaner and an adapter kit. You plan to clear your drain line from outside your home, and the distance from the main drain cleanout to the furthest indoor plumbing fixture (measured around square corners) is between 50 and 100 feet. You only plan to clean your drain line from inside your home, and the distance from your indoor cleanout downstream to the problem area is not more than 50 feet. Clog Hog offers a 150 Ft. Handy Jetter that's designed for service professionals. The Handy Jetter includes a high-capacity steel reel for faster drain cleaning, a heavy-duty inline trigger for easier two-handed operation, and a special high-thrust nozzle (with no forward jet) that helps power the drain cleaner its full 150 ft. length in many 4" ID drains. Clog Hog doesn't sell rotating nozzles because their added length and weight can make it difficult to pass through drain elbows and other transitions in household drains. If you need a nozzle that provides additional scrubbing and pulling force when cleaning drains that aren't completely clogged, you can find an optional High Thrust Nozzle on the Accessories tab of each product page, and when you check out. You should always control the sewer jetter with your pressure washer trigger gun, or with a Handy Jetter inline trigger. For your safety these turn off when your hand does not squeeze down. To avoid injury, do not operate a sewer jetter with any high-pressure valve that can stay open without your hand in place. Note: some 1.2 GPM electric machines with proprietary trigger gun fittings can only connect the sewer jetter to the pressure washer hose. When bypassing the trigger gun of these small machines, use extra care to operate the sewer jetter only when the nozzle is at least one foot inside the drain. You can expect the performance of the 100 foot and 50 foot drain cleaners to be the same over their supplied lengths. That's because a pressure washer provides nearly constant GPM flow up to its rated pressure, and therefore produces the same nozzle cleaning and pulling force, regardless of whether the drain cleaner is 100 feet or 50 feet long. This is not recommended for two reasons. The Clog Hog drain cleaner uses a high pressure line and nozzle that are matched to work within the limits of your pressure washer. Adding more line will overload most machines. Any metal coupling that you'd use to connect two high pressure lines together will be inflexible and weaker than the jetter line. Should the coupling break inside a drain pipe you'd have a difficult extraction job. If you're comfortable doing the math and assembly, our blog has a series of articles to guide you in building a longer jetter using parts that you buy from other suppliers. You can choose a Clog Hog drain cleaner model that's designed for your gas-powered or electric machine. For detailed compatibility information, click the Compatibility tab on any product page. You can also contact us with your pressure washer manufacturer and model number, and we'd be glad to recommend a compatible drain cleaner. 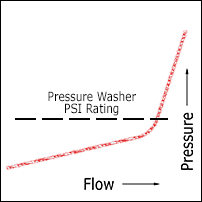 Major brands of consumer electric pressure washers cost $100-$250 and have flows that range from 1.2 to 1.6 GPM. Nozzle force increases with GPM squared, so a 1.2 GPM electric pressure washer will give you less than one–third as much pulling, cleaning and flushing force as a 2.1 GPM gas machine. Electric pressure washers that really produce close to 2 GPM at a pressure that's high enough to operate a sewer jetter generally cost $500 and up. That's much more than the cost of gas machines with higher GPM and PSI ratings. Note: there is one overseas factory that makes private label pressure washers with high advertised flows of 1.7–2.0 GPM (often 1.76 GPM). These machines are sold under many names including Sun Joe, Ivation, PowRyte, WEN, Xtremepower US, GoPlus, Flagup, Binxin, Powerhouse, Costway, Arksen, Meditool and others. 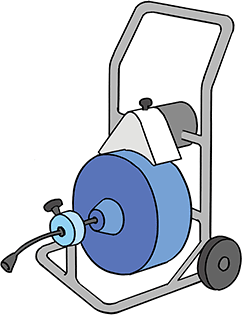 Customers report that these private label machines produce far less than their advertised GPM flows at their rated pressures— typically closer to 1 GPM. If your pressure washer produces only around 1 GPM at its rated pressure, it's suitable only for simple drain cleaning jobs where the clog is less than 30 feet from the drain opening, there are few elbows or transitions in the line, and there is only lightweight indoor waste that can be easily broken up and flushed. To verify the GPM flow of your pressure washer, use its most restrictive (highest force) nozzle tip or spray setting, spray into a 5 gallon plastic hardware store bucket with the lid nearly closed for exactly 60 seconds, and pour out the contents into a measuring pitcher to find the gallon output. The pressure in a 100 Ft Clog Hog Residential drain cleaner increases sharply at all flows over 2.9 GPM. If your pressure washer is rated more than 2.9 GPM, choose one of our Commercial Gas sewer jetters rated for 3.0 to 4.0 GPM to avoid overloading your machine. Overloading your pressure washer will result in constant cycling of its unloader valve and close to zero cleaning and pulling force. We accept credit card orders through our website, and by phone at 800-249-1450 (9-5 M-F CST). Please contact us for assistance if you're having difficulty ordering online. Note that we don't accept orders by email, fax, or mail, or payments by check. You can also download and print our Sewer Jetter Guide that's full of tips and information. Efficient Power. 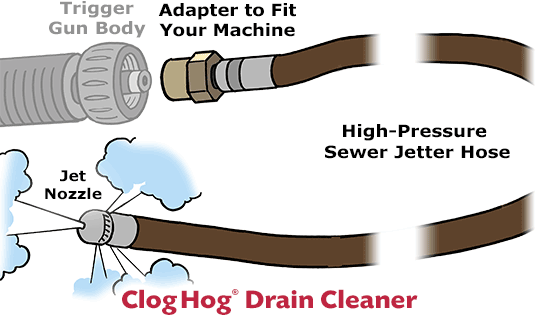 The Clog Hog drain cleaner pulls itself into clogged pipes using the force of water from your pressure washer. In contrast, a mechanical drain cleaner uses an electric motor that twists a cable into the drain by mechanical force. Thorough Scrubbing. The Clog Hog drain cleaner scrubs your pipes with a high-pressure water spray as it travels up the line. Effective Cleansing. After its jet nozzle breaks apart a clog, the Clog Hog drain cleaner helps wash the residue out of your drain pipe. Less Work. A Clog Hog drain cleaner pulls itself through your pipes so you don't have to wrangle a heavy drain snake cable to reach the clog. Lower Cost. A Clog Hog drain cleaner costs only a fraction of what you'd pay for a mechanical drain snake of the same length. Lighter Weight. You can easily carry a Clog Hog drain cleaner in one hand. Compare this to mechanical drain cleaners that can weigh from 70 to over 250 lbs. Simpler Cleanup. The Clog Hog drain cleaner has no electrical or moving mechanical parts so you can safely clean it with the gentle nozzle of your pressure washer after use. After cleaning you can hang it in your garage or shed without bringing odors indoors. Flexible Setup. Because the Clog Hog drain cleaner is lightweight and easier to keep clean, it can be suitable for both outdoor and indoor use. The Clog Hog drain cleaner isn't designed to extract tree roots, large rocks or jewelry and can't solve structural piping problems. If you suspect that you might have one of these issues you should contact a licensed plumber for help. You can visit our Drain Cleaning Tips page for tips to choose the right drain cleaner. Every Clog Hog drain cleaner has these key advantages. Precision made for your size of pressure washer. Your Clog Hog drain cleaner combines specially sized components with a precision machined nozzle to give the best performance with your size of gas or electric pressure washer. Real quality. Every Clog Hog drain cleaner has a sewer jetter hose and nozzle that are manufactured from professional grade materials. Fully assembled and ready to use. Your Clog Hog drain cleaner comes ready to use, with adapters available to fit most sizes of pressure washer, right out of the package. Service before and after the sale. You can contact us for help by email or telephone, before or after you buy. Clog Hog drain cleaners are manufactured in the USA, using US-made and imported components. You can save time by planning your drain cleaning job in advance. Plan your access. It's usually easiest to clear the main drain starting from a downhill opening and working in an uphill direction. Locate both a primary drain opening such a main drain cleanout outside your home or in a basement, and an alternative opening upstream of the clog (should it become necessary) such as an indoor drain opening or a roof vent. Get the right safety gear. 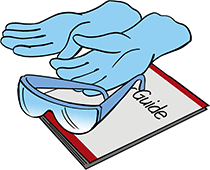 When using a sewer jetter always wear thick, fluid-resistant work gloves and eye protection. Check your pressure washer. Before connecting your sewer jetter, test your pressure washer by spraying with its highest pressure setting for at least 15 seconds. If the machine works without its engine stalling or the unloader valve cycling off and on, it's likely to be in good condition. Flush all hoses with clean water. A small piece of dirt that could enter your garden hose or high-pressure hose during storage can plug the jetter nozzle, so before connecting the drain cleaner you should always run water through all supply hoses, the pressure washer and trigger gun until you are sure that the water is clean. Know the condition of your pipes. You should call a licensed plumber for help if you suspect that your drains have structural problems caused by foundation cracks or large tree roots, or if you live in an historic home that has ceramic or wood fiber drain pipes. You can visit our Drain Cleaning Tips page for more tips to unclog different kinds of drains. Nozzle jets can sometimes be blocked by small debris that can enter the supply hoses during storage and assembly. That's why it's important to flush the supply hoses, pressure washer and trigger gun with clean water each time before attaching the sewer jetter. Insert a tiny pin into the blocked nozzle and, using care not to break the pin, check to see if this clears the blockage. For easier cleaning we offer a miniature nozzle cleaning tool with a spiral cut, tapered stainless steel shaft. To clear out larger sediment, remove the sewer jetter nozzle by using two sets of wrenches or pliers to secure both the nozzle and the steel fitting on the jetter hose, then loosen the nozzle by turning it counterclockwise. Take care not to twist the steel fitting against the hose. When the nozzle is removed, rap it squarely against a clean, hard surface to dislodge any sediment. Before replacing the nozzle, connect the supply hoses, pressure washer, and trigger gun to the sewer jetter and without starting the pressure washer run low-pressure water through to clear out any remaining debris. Then turn off the water, replace and re-tighten the nozzle. Important: grasp only the exposed metal surfaces of the nozzle and fitting with the pliers or wrench. Do not grasp or twist the jetter hose or any soft coating. If no water flows out of the jetter nozzle it's likely that dirt or debris has entered the jetter from an open garden hose or another source. Note: it's rare for jetters to become completely clogged. However, because a small amount of debris can block your jetter, before connecting the jetter to your pressure washer you should always run water through all supply hoses, the pressure washer and trigger gun until you are certain that the water supply is clean. If your jetter is completely clogged, first remove the nozzle to check for dirt inside. 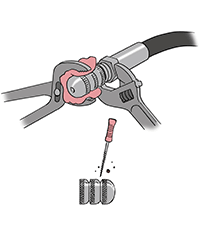 To remove the jetter nozzle secure the collar of the jetter hose with pliers wrapped in a cloth or a wrench, and loosen the nozzle with a second set of pliers wrapped in a cloth. Take care not to twist the steel collar against the hose. Check the inside of the nozzle for debris. If you find dirt or debris inside the nozzle you can usually remove it by rapping the nozzle opening squarely against a clean, hard surface to dislodge the sediment, or by using a Q-tip®. Then replace and re-tighten the nozzle. If the inside of the nozzle is clean or only partially blocked, a significant amount of dirt or debris could be blocking the opposite (inlet) side of the jetter. It's usually easiest to clear inlet blockages using compressed air from an automotive tire pump or compressor that's connected to the nozzle end of the jetter. Please contact us for assistance before cleaning your jetter with air. When used with a compatible Clog Hog drain cleaner your pressure washer should work without overloading. When a pressure washer is overloaded its unloader valve will cycle off and on. This sounds the same as constantly squeezing and releasing the spray gun trigger, and can result in much lower cleaning efficiency. The most common reason for a pressure washer to become overloaded is reduced performance caused by old gasoline, a gas engine in need of a tune up, or a pressure washer pump valve that becomes stuck after a long period of inactivity. To test your machine's performance before connecting the drain cleaner, use your pressure washer on its most powerful setting. If you can spray normally for at least 15 seconds without the engine stalling or the unloader valve cycling off and on, it's likely that your pressure washer is in good condition. The second most common reason for a pressure washer to become overloaded is dirt or debris entering the jetter from an open garden hose, decaying garden hose seals, or another source. To check for a blocked jetter, attach the pressure washer to the garden hose, connect the trigger gun and jetter, turn on the garden hose valve, and without starting the pressure washer squeeze the spray gun trigger so that water at low, household pressure flows through the jetter. If the jetter hose and nozzle are free of debris you'll see four constant, solid water streams spraying from the jetter nozzle and the back streams will be of equal size. If the nozzle is blocked you'll see inconsistent, weak, or fluctuating streams. In this case you can clean the nozzle as shown in the nozzle cleaning section of this page. If the sewer jetter has difficulty passing through a particular section of drain pipe there are several possible solutions. You can pulse the flow of water with the pressure washer trigger gun as you pull back on the line and feed it forward. Often times this helps the nozzle pass through an elbow or other transition. 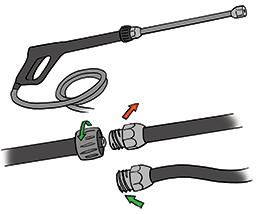 You can disconnect the jetter from the pressure washer trigger gun, coil up the exposed line, turn the bundle several times in a clockwise direction to add some twist to the line, and continue to slowly twist the line as you snake it through the problem area. 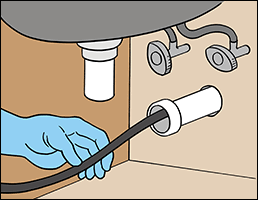 Then reconnect the drain cleaner, resume the flow of water, and continue to feed the sewer jetter into the drain. Check to be sure that the all of the jetter nozzle orifices are spraying at full force. To check for a partially blocked nozzle, attach the pressure washer to the garden hose, connect the trigger gun and jetter, turn on the garden hose valve, and without starting the pressure washer squeeze the spray gun trigger so that water at low, household pressure flows through the jetter. If the jetter hose and nozzle are free of debris you'll see four constant, solid water streams spraying from the jetter nozzle and the back streams will be of equal size. If the nozzle is blocked you'll see inconsistent, weak, or fluctuating streams. For tips to clear a blocked nozzle visit the nozzle cleaning section of this page. 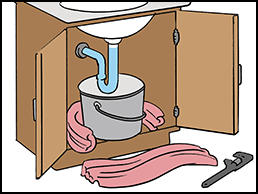 If none of these approaches work, you can try an alternative drain opening to reach the clog – for example, by starting at an indoor cleanout under a sink or at a roof vent, and jetting downhill. If your pressure washer is rated below 2.0 GPM, try using a machine with a higher GPM rating to better power the jetter through the pipe. If you need additional force to propel the drain cleaner through an elbow or transition, you can try the optional High Thrust Nozzle that's shown on the Accessories tab of each product page. Customers in the USA can often receive their orders 1-3 days faster by providing a street address for shipping, and not a PO Box address. Your street address is always required for UPS shipping, since UPS does not deliver to PO boxes. US customers can also specify added-cost Next-Day and 2nd-Day Air delivery. This option appears on the payment page of your checkout, before you enter payment details. Customers outside the USA should provide a telephone number to help speed customs clearance. We ship to the Continental USA by UPS and USPS. We ship to other regions worldwide by US Postal Service Priority Mail. Shipping rates are calculated at checkout. For delivery to US military FPO addresses please choose USPS shipping when you check out. To find an exact shipping cost before entering any payment card information, visit your product page, click Add to Cart, on the first Cart page enter your country, state or province, postal code, and choice of service. Additional delivery options may be offered when you check out. We ship on the same day more than 90% of orders received online before 3:00 PM (US Central time) Monday through Friday, except on UPS holidays. Standard delivery to the Continental USA usually takes 3-5 business days after receipt of your order. Standard delivery to Alaska, Hawaii, and Puerto Rico usually takes 4-6 business days after receipt of your order. Priority Mail International delivery to most countries outside the USA usually takes 6-12 business days after receipt of your order. Backlog in your local customs can sometimes add several days to this delivery time. Customers in the USA can specify added-cost Next Day Air or 2nd Day Air shipping at checkout. To calculate a detailed US delivery time estimate visit the UPS website. We ship from near Austin, Texas , our Zip Code is 78613, and our standard shipping is by UPS Ground. Note that to view UPS Ground delivery times you must specify a weekday shipping date. We ship from the Austin, Texas area. Clog Hog products are sold online; there are no international retailers who stock our products. Our products are delivered outside the USA by USPS Priority Mail. Delivery times for international orders usually range from 3 to 4 weeks, including backlog in your local customs office. Delivery from customs to your address is by your national postal service, who may charge sales tax. You can see your exact shipping cost, before entering any payment card information, by adding your item(s) to the Cart, and on the first Cart page entering your country and postal code. You can contact us if you need parts to repair your Clog Hog drain cleaner. Please let us know the email address (or name and Zip code) used on your order, and some details about the needed repair, so that we can find the correct items. Please visit our Warranty page for details about our return policy.